In a society where women are treated as second class citizens, Zahra Rahnavard defied the regime. She openly campaigned and gave speeches in support of her husband Hossein Mousavi. The very popular Zahra Rahnavard, wife of Hossein Mousavi, demanded the release of detained democracy protesters today. Zahra posted the message on Hossein Mousavi’s website today. The wife of Iranian opposition candidate Mir Hossein Mousavi called for the immediate release of detained protesters as her husband was to appear at a mass protest outside the country’s parliament. In her statement, which appeared on Mousavi’s Web site, Zahra Rahnavard said it was her “duty” to continue “legal” protests and condemned the presence of armed guards in the streets, Reuters reported. “I regret the arrest of many politicians and people and want their immediate release,” Rahnavard said in the Web site statement, according to Reuters. 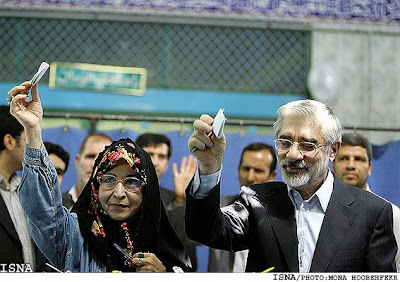 Rahnavard has raised eyebrows in Tehran for campaigning alongside her husband in the conservative state, and emerged as an important asset in her husband’s campaign. Related… Protest organizers were arrested in Tehran today.